Harrison Shih is president of Frankly. Following the launches of brand-centric services on sites like Facebook, YouTube, LinkedIn, and Google+, social media was the place for businesses to acquire new users and engage their fans. This seemed like an efficient way to get exposure: Businesses could essentially “rent” a spot on Facebook, much like a small shoe brand could rent a store in the mall to take advantage of the infrastructure and heavy foot traffic. As brand pages grew on social sites, they tracked volume metrics such as the number of “likes” or followers, as well as interactions such as sharing and re-posts of their published content. While a page’s number of followers has value, and can certainly predict the health of a brand’s community, it doesn’t equate to true value. Many social media metrics are vanity metrics. In reality, it’s engagement that really matters. Unfortunately, brands have over-invested in social efforts on external social platforms that are seeing diminishing organic engagement. In January this year, the average Facebook post created by a brand with more than 100,000 likes had a 0.14 percent engagement rate (Socialbakers). And late last year, the top 25 most engaging brands on Twitter had a post engagement rate of just .07 percent (Socialbakers). One cause of this is sheer noise. Social media platforms are now incredibly crowded, with businesses big and small competing with each other for a user’s attention, as well as with the deluge of content generated by a user’s personal network and their favorite entertainment content creators. What’s more worrisome is that brands have no choice but to accept the business decisions made by the social media platforms themselves. Analysts predict that organic reach — how many users will see a post at all, let alone engage with it — on social media sites will approach 0 percent as platforms make room for their paid social media ads, which are now an $8.5 billion dollar marketing industry. Ultimately, the social platform owner is in charge, and they can restrict organic reach and dictate branding guidelines just as a landlord can raise the rent and evict tenants. 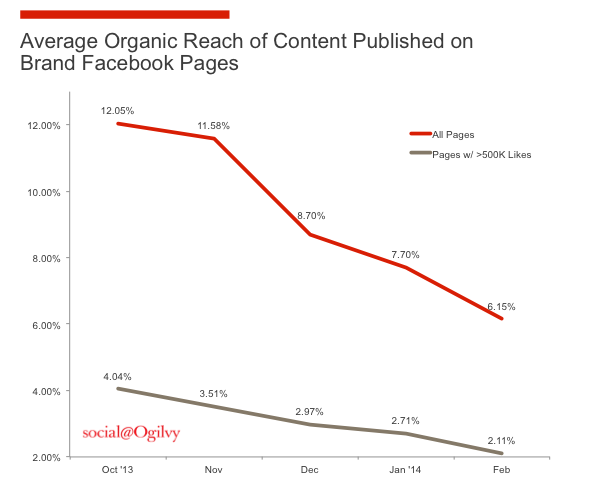 Look no further than Facebook’s track record for brand-page-post organic reach and its rapid decline since 2013. Today, on average, Facebook pages can only reach 6 percent of their fans organically (and a dismal 2 percent for larger pages), which is half of the reach they had one and a half years ago. So even if a user “likes” your Facebook page, and you count them as a fan, it’s becoming less and less likely that they will see your posts at all. There’s no exclusivity on these platforms, and noise is inevitable, even for people who have asked to hear from you and have the potential to be very valuable customers. Average organic reach of content published on Facebook across 100 Facebook brand pages around the world, accounting for more than 48 million total fans (social@Ogilvy). In addition to restricting organic reach, Facebook makes regular updates to site algorithms that affect who sees how much of what content. At any time, Facebook can restrict or change their posting and identity guidelines. This brings us to the broader point: Facebook calls the shots on its platform because it is the “landlord.” Brands are subject to its rules, whims and, ultimately, rent hikes. In the beginning, brands moved in to their leased social spaces, invested heavily in content creation to draw users in and received impressive engagement. The original value proposition of leased social communities was clear: a trade of high-quality content for temporary exposure. But today, as organic reach evaporates, the high investment required to create unique content returns diminished value. Because ultimately, the social platform owner is in charge, and they can restrict organic reach and dictate branding guidelines just as a landlord can raise the rent and evict tenants. On top of this, all of the investments brands make on these leased social properties build no long-term equity for the brand, because the social sites own their fans’ user accounts, photos, posts and data. Social presence is an important part of marketing for brand awareness, discoverability and developing your voice, and cultivating a following on these leased social platforms is a necessary evil to achieve this. It’s important to remember the value in investing in your own properties, those that offer equity and growth in value over time. What can you do to break out of these “lease” habits when you participate in social marketing? Consider investing in an owned social community — it’s a great way to diversify your social assets. One example of owned social media is a forum on a brand’s website, a popular community platform in the desktop-web era. But as with real estate, the mantra is the same: location, location, location. Where you invest in building your owned social community is critical. Build where your users are — on mobile. A solid majority of all time spent on digital media (60 percent) is on mobile, and 86 percent of that is on native apps. Capitalize on mobile today for big gains in the future. Digital media engagement grew 24 percent in the last year, driven primarily by mobile (comScore). Imagine what is to come. Now that we’re a mobile-driven world, owned social communities can have homes that are real-time, immediate and accommodate their mobile habits. Businesses should invest in a strong branded native app presence to host their super fans in a dedicated space. This also will allow them to take advantage of mobile messaging capabilities, which Mary Meeker predicts will dominate our lives as a de facto communication method (and we’re well on our way there, as six out of the 10 most-used apps on mobile are messaging apps). You can control tone of voice, promotions, cadence of information, engagement rates and everything else when you own your social community. These are tools any great marketer should arm themselves with in the new age of mobile engagement. Even more importantly, owned social communities are a place for quality user engagement and community growth. Quality engagement is much more powerful than quantity of followers. If you have 100,000 followers on your leased social media pages, you can now create a different space for your highest-quality users — the 1,000 or 5,000 hyper-active users that are passionate about you. Provide a space for your super fans to meet each other and engage with you directly, which is something they can’t do on typical social media sites alone. 1. Authentic Interest-based conversations. Conversations are the new name of the game. Marketing is no longer about the simple broadcast of content, which already saturates every social and media site. Technology has moved on, and now it’s about the immediacy, intimacy and interaction that only conversation can provide. Your owned social community is laser-focused on a shared interest. Users join it because they’re passionate about an interest and their active participation quickly reveals their level of loyalty and affinity to your brand and the interests you enable. There are no distractions from other brands, and, if there are, it’s because you put them there for strategic purposes. Topics can be fluid, allowing users to discuss anything they like, privately (1:1 with your representatives or another fan) or broadly (with the whole community). Social media conversations, on the other hand, can feel “on display,” stilted or limited to customer service topics. 2. User insights. When a conversation unfolds on your own properties, you see it in its purest form. You can moderate, guide and digest all the qualitative and quantitative data your users produce, giving you access to immediate market research without speculation from scraping your leased properties. You are free to run tests and promotions and are in complete control of the communication between your brand and your brand’s fans. Leased social communities have been dominant because they’re easy to create. Luckily for the visionary marketer, technology is moving forward rapidly, and the barriers to creating your owned social community are coming down. Although it takes work to build a place for your fans to aggregate on your mobile and web properties — your “home turf” — that work builds a foundation for quality engagement. And remember: Owned social and leased social properties are not mutually exclusive. They complement each other, and you can use your social media pages to drive super fans to your properties where they can engage in a deeper way. Don’t build your brand on rented land alone. It’s time to take back control of your user engagement and give your most devoted fans a home.